I recently spent a week behind the wheel of the 2016 Hyundai Veloster Turbo Rally Edition and when that week was done, I had a new appreciation for a car that I really enjoyed when it was introduced in the lower performance Turbo package a few years back – while still loving the unique 3-door design of the funky little hatchback. When the Hyundai Veloster Turbo was introduced for the 2012 model year, some people were quick to slight the fun little hatchback due to the fact that the automaker hadn’t done enough to transform the Veloster into the Veloster Turbo. The Veloster Turbo had a unique exterior design, a unique interior layout and a then-new turbocharged engine delivering 201 horsepower and 195lb-ft of torque – features which I felt made the Turbo model far more engaging than the non-turbo models. It looked sportier inside and out while also having a decided advantage in power, making it far more interesting to buyers who wanted their Korean hatch to have a little more attitude. However, while the Veloster Turbo was a ton more fun than the standard Veloster with the naturally aspirated engine, it was still knocked for not being spicy enough for a performance model. To address this issue, they added the R-Spec model above the Turbo and above that sits the Veloster Turbo Rally Edition. This limited edition package adds some unique features that make this Veloster the most fun to drive of any production variants released thus far, but it does so in a way that maintains all of the charm needed from a good daily driver, including the “extra” rear passenger door that improves rear-seat access while preserving the 2-door hatchback look. In short, the 2016 Hyundai Veloster Turbo Rally Edition is a great improvement on a car that I liked a great deal in plain “Turbo” trim, making this stunning matte blue beauty my new favorite Korean compact. While opinions on exterior appearance are purely subjective, I really like the look of the Hyundai Veloster Turbo and the Rally Edition package doesn’t stray far from the original performance package. The Rally package adds black painted lightweight Rays Engineering 18 inch wheels and a unique matte blue paint, in addition to some carbon fiber-looking trim along the bottom of the front fascia and in the side sills. The Rally Edition also includes the Turbo-specific front fascia with the huge grille open, the angular sculpting between the LED-trimmed projection headlights and the large, round fog lights, a low profile rear spoiler and a unique rear fascia with a more aggressive design (compared to non-turbo models) and lower diffuser wrapped around the central dual exhaust tips. Finally, all of the parts of the car that aren’t matte blue or carbon fiber are black – from the wheels to the window trim – tying together the whole sporty package. A simple “Rally Edition” badge on the rear hatch completes the sporty package and the result is a car that certainly fits the “rally car” look from front to back.Where all Hyundai Velosters differ from other small hatchbacks with a 2-door design is the in addition of the unique rear passenger door. On the driver’s side, the Veloster Turbo Rally has a large, singular driver’s door, but on the passenger side, the front door is slightly smaller – making room for an addition passenger’s side door. Both of the doors on the right side of the car are plenty big enough for an adult to get into the front or back seat, while still giving the driver the “coupe feel” when getting in and out. If you love the hassle of moving a front seat to squeeze someone into the back seat, you can still do that on the driver’s side, but the Veloster allows easy passenger loading and easy cargo loading for the rear seat. I will address the advantages of the Veloster’s third door in our interior section. The Rally Edition of the Veloster Turbo doesn’t vary all that much from the original Turbo package, but the gorgeous matte blue paint, the black Ray’s wheels and the unique body cladding gives the Veloster the race-ready look that you get with the Hyundai rally race cars. The Veloster Turbo Rally Edition package doesn’t get any huge changes on the inside, but that really isn’t a problem. 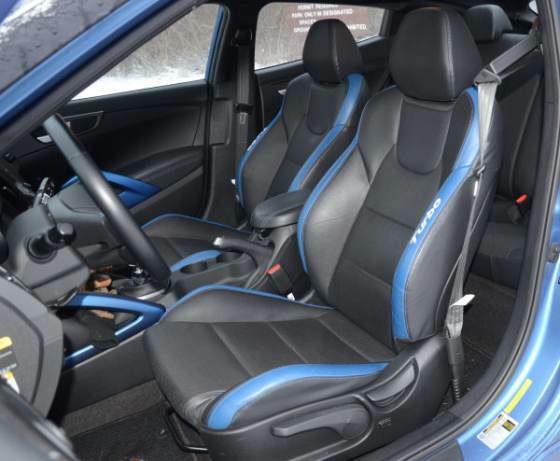 The Rally Edition includes the same sport bucket seats up front with deep side and base bolsters to keep the driver and front passenger firmly in place during spirited driving. Like the door grab handles and some other trim on the center column, the Turbo Rally Edition seat bolsters are finished in bright blue, combining with the matte blue exterior paint for a very sporty look. In terms of interior space, the Veloster has plenty of space up front for very tall drivers and passengers. In the rear seats with the front seats adjusted to comfortably accommodate a pair of 6 foot tall people, the rear leg room is a little tight for an adult of similar size. If you have four tall guys, seating will be a little cramped on a long drive, but as someone who has a family of three – the Veloster design is excellent for loading a teenager into the rear seats. My kid is old enough and tall enough that he doesn’t want to climb over a front seat to get into the back like he has to with most coupe-shaped vehicles, but the extra passenger door allows him easier access = especially when my wife and I were already seated in the front. Really, if you spend a ton of time with four adults in your car, the Hyundai Elantra GT is probably a better fit, but for someone with a small family of 3 or 4, the Veloster design is very handy. The Veloster Turbo Rally Edition only comes in one trimline, and that is fully loaded. The gauge cluster includes a small driver information screen with a variety of readout options between a large analog speedometer and tachometer. A large touch screen mounted high on the center cluster allows quick access to the sound system and the hands-free phone system in cooperation with the buttons on the steering wheel, but curiously, navigation is not available with the Rally package and the climate control has a traditional button-and-knob layout that is as simple and user-friendly as it gets. No fancy dual zone system here, and that is fine by me. The only actual unique features of the Rally Edition are the specially branded floormats and the B&M short throw shifter, but the cockpit of this sporty little hatchback has everything that could want…with the exception of navigation. The 2016 Hyundai Veloster Turbo Rally Edition has the same 1.6L turbocharged engine with 201hp and 195lb-ft of torque as the Veloster Turbo and the Veloster Turbo R-Spec, but the Rally package the most aggressive springs, dampers and anti-roll bars available from the factory on this funky little hatchback. Those new suspension components make the Rally Edition the best handling of the Veloster models, with less body roll and more control through both tight, low speed turns and sweeping, higher speed turns. Mind you, I liked how the Veloster Turbo handled tight turns, but this new setup makes the Rally Edition more nimble than its siblings and that is a beautiful thing. The Rally Edition is a little stiffer during normal driving situations, but it isn’t stiff enough to make the car uncomfortable for daily driving – even on Detroit’s rough roadways or my local unpaved roads. It might not handle the dirt like the AWD rally cars, but this car is easily new front-wheel drive rally sweetheart. 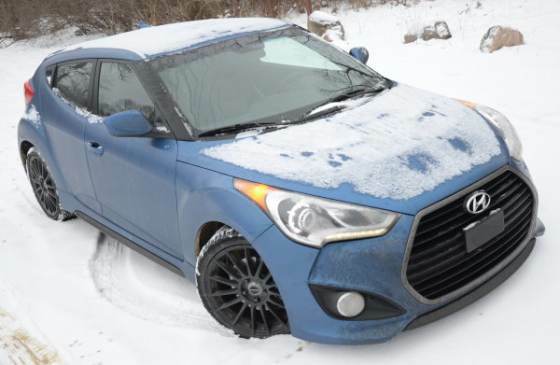 The day that I took delivery of the 2016 Hyundai Veloster Turbo Rally Edition also brought us several inches of snow following an evening of freezing rain. With the Veloster Rally having all-season performance tires and front wheel drive, I was concerned that this sporty hatchback wouldn’t be much good on my ice-and-snow covered local roads. My concerns were unfounded, as the Veloster Turbo Rally Edition performed beautifully on the slippery roads – whether I was on local paved roads or the area highways. Oh, the Veloster Rally also handled my many local snow-covered dirt roads as smoothly as you would expect a front wheel drive car with the word “rally” in the name. On all of the available road surfaces, the Veloster Turbo Rally accelerated, cornered and slowed down very nicely. Ultimately, I wouldn’t think twice about buying the Veloster Turbo Rally Edition living in snowy Michigan, as it did as well as any front-drive compact I have tested in the snow…which is impressive from a sporty model like this one. Fortunately, the snow and ice only lasted the first few days of my time in the Veloster Turbo Rally Edition and when the roads had dried up, I got to experience all of the goodness that this package has to offer. In addition to the improved handling characteristics of the Rally package, the 1.6L turbo engine offers excellent power through the mid-range and high end. When you launch hard from a stop, there is just a slight hint of lag as the turbo spools up, but it isn’t a significant enough delay for the average new car buyer to even notice. When you drop the clutch and the RPMs soar, the Veloster Rally quickly ships enough power to the front wheels to get them spinning, but a quick feathering of the throttle gets the wheels gripping and the car moving out. The B&M shifter allows for more comfortable performance shifting, allowing you to bang through the gears with ease and if you keep the revs high – the Veloster turbo engine provides a very steady powerband from a stop up beyond any posted speed limit in this area. In terms of fuel economy, the EPA expects the Veloster Turbo Rally Edition to return the same figures as the Turbo and the Turbo R-Spec models, with 25mpg around town, 33mpg on the highway and 28mpg combined. While the onboard computer indicated that I was getting better than the prescribed 33mpg on the highway, the wintery driving conditions took their toll on my overall fuel economy numbers. I averaged just 26.3mpg, but that includes several days of driving in ice and snow followed by several days of spirited driving – all of which leads to lesser fuel economy. If you liked driving the original Hyundai Veloster Turbo, you are guaranteed to like the Rally Edition package even more. It includes all of the features that make the Turbo package so much fun, adding a revamped suspension setup for those who need the best handling possible from the factory. This package affords you more corner-carving capabilities while still being more than comfortable enough to serve as a great daily driver. The Veloster Rally handles winter weather very well and on dry roads, this car is a ton of fun to drive. This is the best Veloster yet from a driver’s perspective, while also being one of the more engaging compact hatchbacks on sale in the US market. There is no question that the Hyundai Veloster Turbo has a striking exterior design that inspires strong opinions – whether you love it or hate it. In my case, I love the unique design of the Turbo package, while the addition of the Rays wheels and matte blue paint of the Rally Edition package make for an even cooler looking hatchback. Add to this sharp exterior design a sporty, well-appointed cabin, a turbocharged engine mated to a manual transmission and a sport-tuned performance suspension package and the result is a Korean hot hatch that is fun to drive in any condition while offering easier access to the rear seat – ideal for someone with a small family. The Rally Edition is literally an improved version of the Hyundai Veloster Turbo and while I can always ask for more power, I really don’t have anything to complain about with the best-performing trimline in the Veloster lineup. If you want a compact hatchback with a 2-door exterior design, a powerful yet efficient engine, a proper sport tuned suspension setup and easy access to the rear seat for kids or cargo – the Veloster Turbo Rally could be your ideal new daily driver. The roof is on and the plumbing has been started!